This Thursday the Washington Redskins will draft RGIII, probably the most exciting thing to happen to the team since Sean Taylor inverted an opposing punter. In urban planning circles, a much more pressing issue is that the Mayor and some Councilmembers want to spend public money to entice the team to build a practice facility on Reservation 13, a master-planned new neighborhood near RFK, in hopes that the team might someday relocate back to the District from Landover. For the politically correct, it's hard to have any conversation about the 'Skins without noting the obvious: the team name is kinda racist. The Redskins are unique in that they are the only team named after a non-mythical race of people. In some enlightened, hypothetical future universe our city's team would succumb to a grassroots movement and choose a superior moniker, but for now, public disapproval is quenched by a chuckle-inducing opportunity to brainstorm alternate team names. While RGIII will have to show me some results before I consider transferring my allegiance to his new team, I will without hesitation jump on this renaming bandwagon and toss out my own geographically-appropriate proposal: Hail to the Prince George's Pinkskins! If you have ever traveled down Martin Luther King Jr. Ave SE in Anacostia, you may be familiar with Morgan's Family Fish Fry. One order of flounder at Morgan's contained about 17 fried fillets, over-stuffed into a standard Styrofoam tray. Now Morgan's is no more. I first noticed the absence of activity at 2323 MLK a couple of months ago, and the For Sale sign confirms it. This is one of the larger properties on the business strip to hit the market recently, and it offers the advantageous combination of being located close to the Metro and outside of the historic district (meaning there are fewer restrictions on redevelopment). If the eventual purchaser follows in the footsteps of most commercial property owners in the neighborhood, he/she will hold it vacant indefinitely, speculating that at some point in the future the redeveloped property will command the high rents that it would need to justify the development costs and still turn a profit. Before this week, I had heard the term Crowdsourcing, but then all of a sudden it got tons of hype, specifically as it relates to having neighborhood residents identify a preferred retailer for a site. Elahe Izadi thinks it's classist; Richard Layman thinks it's stupid; I just think it's fun. 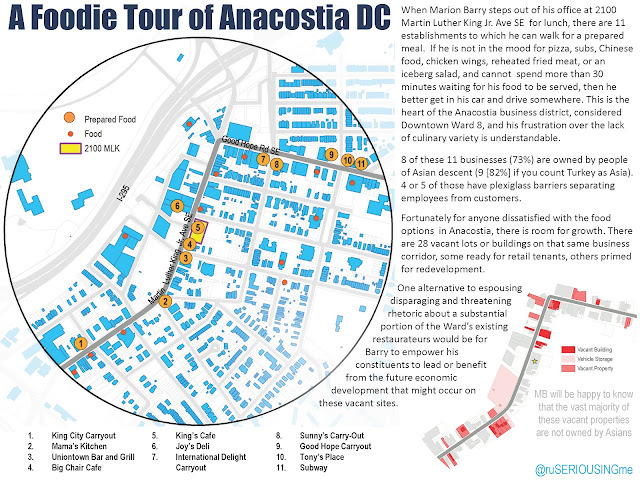 So, based on absolutely zero reality, here are four hypothetical options for this site. They range from optimistic to pessimistic, and each has impacts associated with it that should be taken into consideration. A) Redeveloped with Busboys and Poets restaurant on the ground floor and three stories of subsidized rental apartments above. Creates jobs and slightly increases property values (and taxes) for homeowners in the surrounding neighborhood, but also raises commercial and residential rents. Increases traffic and night-time noise, and makes it more difficult to find street parking within a few blocks of the site. B) Redeveloped as a Five Guys restaurant and a bank on the ground floor, with three stories of commercial office space above. Creates a number of retail jobs for neighborhood residents, but most office jobs will already be filled by people from across the region. Increases traffic on Martin Luther King Jr. Ave and Howard Road during the morning, lunch-time, and afternoon rush hours. C) Existing building reused as a Wendy's restaurant with drive-through window. Increases traffic slightly throughout the day and creates some entry-level jobs. No impact on property values, and does not increase rental rates in nearby homes or lease rates for neighboring businesses. What good is a fancy restaurant if I can't afford to eat there anyways? D) Site remains vacant and parking lot is used informally by patrons of nearby businesses. 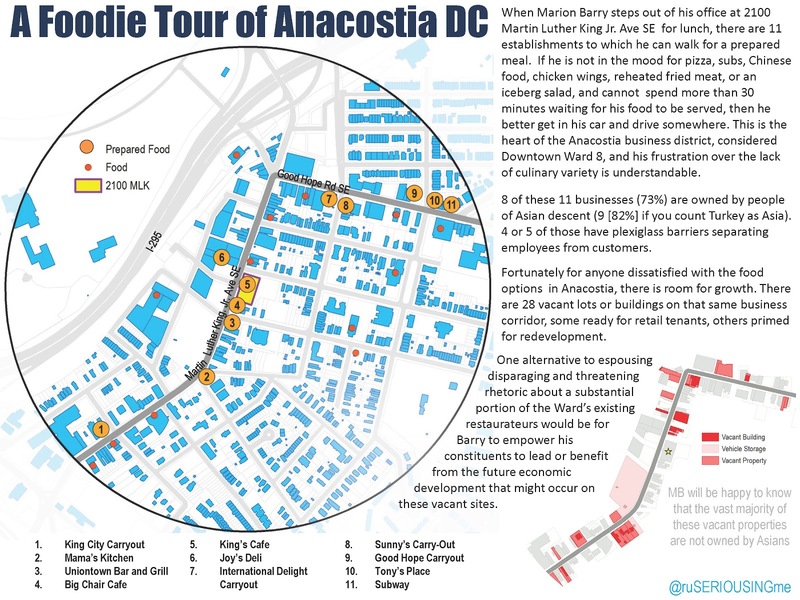 No impact on traffic on Martin Luther King Jr. Ave, and lack of development prevents rents from increasing for residents of the surrounding neighborhoods. I like the neighborhood exactly how it is, and I don't want any changes that will attract new residents or increase my cost of living! 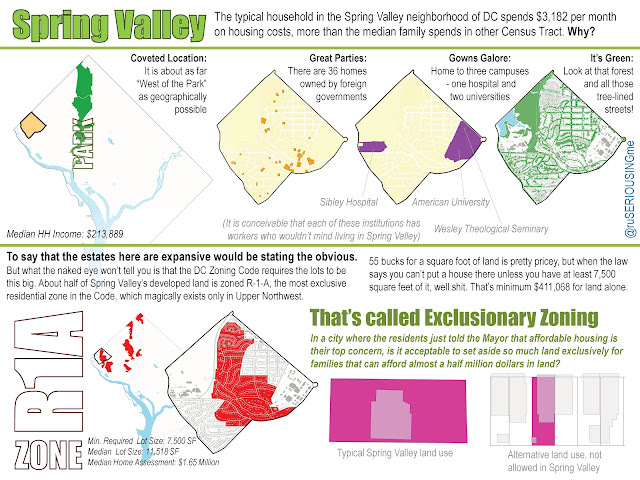 When you think of subsidized housing, you probably picture a scene from the PJs or The Wire. Don't. Funding for low-income housing accounts for only a small portion of government housing subsidies in the US. Zoning Regulations - rules or one-time determinations that require the construction of affordable housing units (rental or for sale) as part of a larger development, in exchange for government relaxation of applicable zoning restrictions. Government deserves a cookie for the sheer number of low-income housing policies and programs it has implemented, but when you look at all housing subsidies dished out (not just those that target the poor), the above list only represent a drop in the bucket. By far, the biggest government subsidy the government offers to help individuals and families pay for housing is the Home Mortgage Interest Deduction (MID), which was claimed on about 26% of all DC individual tax returns. The Mortgage Interest Deduction allows homeowners to reduce their Adjusted Gross Income (what you pay taxes on) by the amount they paid towards interest on their first $1 million of home mortgage debt. Oh and BTW? You can also deduct the interest on your vacation home (just in case the debt on your primary residence doesn't get you to the million dollar cap). It’s easy to get caught up in semantics on this issue: Unlike a voucher, which is a direct government expenditure and therefore a more tangible subsidy, the MID is instead foregone government revenue, which is more politically palatable than a direct outlay, but serves the same purpose. Consider two scenarios: (A) getting $10 taken out of your paycheck before you ever see it; and (B) receiving full pay but then having to give $10 right back. If there is a difference between the two, then it is only psychological. One natural reaction to these statistics is to suppose that, as an entitlement program available to all homeowners (about 2/3 of the country), the Mortgage Interest Deduction is likely a shallower subsidy disbursed to a much broader pool of recipients than something like Housing Choice Vouchers, which target a specific income range. That’s true to an extent, but it turns out that the biggest individual beneficiaries of the MID actually receive a greater (and more reliable) subsidy than recipients of housing vouchers. Based on approximate figures provided by the DC Housing Authority (DCHA), the average housing voucher in 2009 was worth $967 monthly. Most (at least 75%) vouchers are reserved for households earning no more than 30% of the Area Median Income, which today translates to a maximum of $32,250 (75 hours per week at minimum wage) for a family of four. Using the industry-standard assumption that households can afford to pay 30% of their income on housing, a family at the upper limit of this spectrum can afford to pay $806 per month for housing. Since most of the families eligible for vouchers earn less than the upper limit, it sounds about right that it would take $967 per month per household to get them into decent housing (Fair Market Rent for a 2BR home in DC is $1,506). This is a steep subsidy, and the overall federal low income housing budget is not astronomical only because, unlike food stamps or Medicaid, housing vouchers and public housing are not entitlement programs, meaning that even if you qualify, you may not receive the benefit. DCHA spends $130 million per year to provide vouchers to 11,200 households, but there are an additional 25,000 to 37,635 on the waiting list. Lower income households are less likely to claim the Mortgage Interest Deduction because (A) they are less likely to own their home, and (B) the sum of their itemized deductions (including mortgage interest payments) is less likely to exceed the standard deduction. The percentage of tax returns claiming the MID for each income range reflects this, with only 9% of households earning under $50k taking the deduction and 80% of households earning over $200k deducting their interest payments. While the subsidy does increase with income, remember that there is a cap to the amount of interest that can be deducted (only that which is paid on mortgage debt up to $1 million). Here’s a hypothetical scenario to illustrate how one might achieve the maximum benefit from the MID: You take out a $1 million loan from the bank at 5% interest to buy a big-a$$ house. Over the first 5 years you would pay $240,461 in interest on that loan (an average of $48,092 per year). If you make earn enough money to buy a million dollar house (not extremely uncommon in DC), then your marginal tax rate is probably 35%. Because you can deduct your interest payments from your income, you reduce your tax burden by 0.35 x ~$48k: about $1,402 per month, or 1.5 times what the average voucher holder receives. What’s even more kush about this subsidy is that there is no waiting list, and the benefit never expires! While affordable housing advocates and local politicians nobly debate over whether local tax money should be used to finance the construction of low-income units or for vouchers, the federal government continues its backwards system of giving homeowners (renters, of course, get nathan) a guaranteed subsidy that is disproportionately doled out to the rich. There are a number of ways we could reform the Mortgage Interest Deduction, for example by lowering the cap or by eliminating it completing, but no matter what, an understanding of the subsidy must inform our perception of welfare programs in this country and should be central to any discussion about housing policy. Of all the baloney terms that get thrown around in planning meetings, "neighborhood character" might be my least favorite. Part of DC's "character" (I refuse to say it without quotation marks) is that it is racially and economically segregated, and is increasingly unaffordable to the average mortal. Any policy or tradition that reinforces this disgraceful reality should be revisited. DC is a place where people want to live. There are jobs, universities, and plenty of cultural and recreational attractions. It is the type of diverse and stimulating environment that fosters innovation and tolerance, and we as a city should embrace anyone who wants to call the District home. And yet many of our policies impede the supply of housing from responding to the high demand in a way that might make housing more affordable. Why can't you and 5 families buy a piece of land in Spring Valley and split it into 6 smaller, less expensive pieces and build 6 separate houses? Because that is incompatible with the "neighborhood character." Why can't a non-profit organization buy a property there and build subsidized apartments for low income families? Because apartments would negatively alter the "urban fabric." Apparently there is something inherently wrong with putting anything other than a mansion next to a mansion, because almost all zoning codes prohibit the mixing of uses and building typologies on the majority of the land under their jurisdiction.